MILWAUKEE — It was a big night Wednesday for Wisconsin athletes at Miller Park, capped by veteran infielder Craig Counsell’s three-run homer in the second inning. Before Counsell’s heroics, though, a pair of homegrown Olympians shared the spotlight. 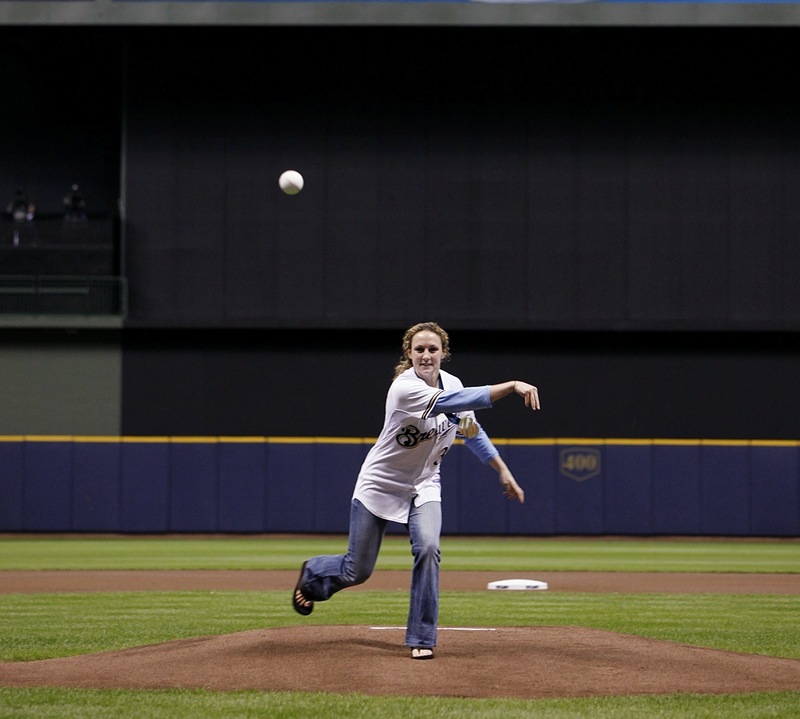 Tossing ceremonial first pitches before the Brewers hosted the Reds were goalie Jessie Vetter and forward Jinelle Zaugg-Siergiej of the United States’ silver-medal winning women’s hockey team. Since their final game against Canada in February, Vetter and Zaugg-Siergiej have been keeping busy with a number of guest appearances, including one at a Milwaukee Admirals game. 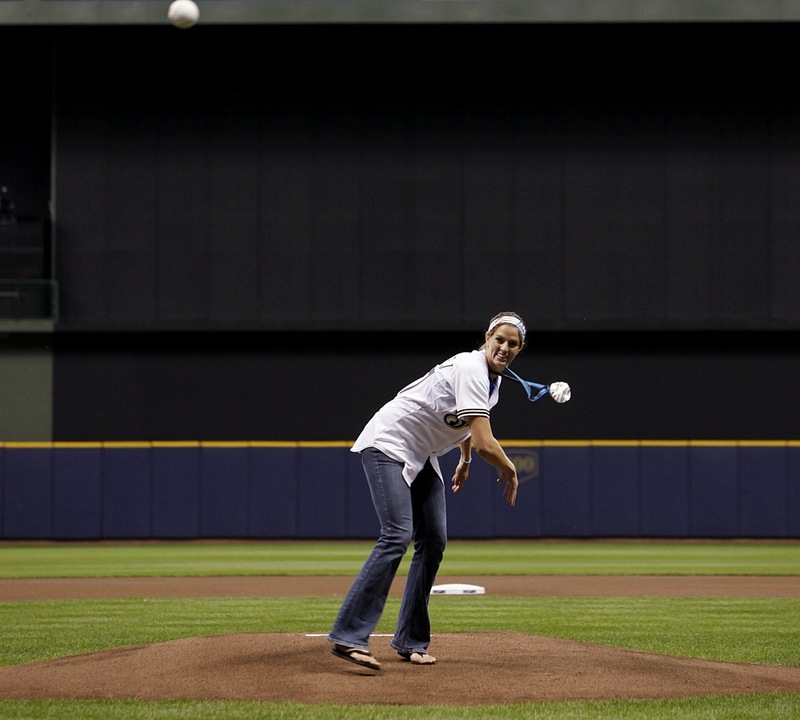 So how did throwing a pitch in front of 27,004 fans at Miller Park rank? “It’s pretty special because Jessie and I are both from Wisconsin,” Zaugg-Siergiej said. “Being able to throw an opening pitch and doing it in your home state, especially now that I’m living in Milwaukee, it means a lot, it’s a lot of fun. Vetter and Zaugg-Siergiej are from Cottage Grove and Eagle River respectively. The two were teammates on the Wisconsin Badgers’ national championship team in 2006. Between celebrating their silver medal victory with the rest of the country through various appearances and coaching and playing hockey, the two have remained busy in the offseason. In fact, Zaugg-Siergiej recently got a new job, which resulted in her moving to the Milwaukee area. “I actually just accepted a coaching position out at Arrowhead for their girls team,” Zaugg-Siergiej said. “I’m also coaching a U14 winter club youth team. Between those two I’m still playing myself, so I still travel and play and train all that kind of stuff. While it was not the most well-attended game of the season for the Brewers, Miller Park still exceeded the 16,805 in attendance for the gold medal game in Vancouver on Feb. 25. Vetter and Zaugg-Siergiej each stepped up in front of that crowd and delivered strong pitches to catcher Jonathan Lucroy behind the plate. “I got a little nervous, but it was fun,” said Zaugg-Siergiej, who added that Vetter’s pitch was the more impressive of the two. “I’m just glad I made it on target all the way to home plate. She did play baseball growing up and I’ve never played baseball before. MILWAUKEE — Corey Hart’s trade value may have taken a hit on Friday when the Brewers right fielder injured his right wrist attempting to catch a fly ball in the third inning of the 7-5 win over the Nationals. But manager Ken Macha and the Brewers just want him in the lineup as soon as they can get him back. As Washington second baseman Cristian Guzman drove a ball deep to right, Hart tracked it toward the right-field line and crashed into the wall as he attempted to catch the eventual foul ball. Hart stayed in the game and finished out the top half of the inning, but was removed in favor of veteran outfielder Jim Edmonds, who pinch-hit for Hart in the bottom of the third and hit a decisive two-run homer in the seventh. After leaving the game, Hart underwent X-rays and an MRI on his wrist, which revealed no fracture. Brewers manager Ken Macha was unsure how long Hart would be out, but considering the way his right fielder has swung the bat since the middle of May, he certainly would like to have him in the lineup as soon as he can. With Hart being the subject of a number of trade rumors this month, the injury could not have come at a more inconvenient time for the club, since any ailment or significant time missed complicates any trade discussions. From his vantage point, though, Macha did not think the injury looked too significant. He added that with the way Hart jammed his hand into the wall, the location of the injury required precautionary measures to be taken. MILWAUKEE — The Brewers are tired of being bruised. Entering Friday’s game, they had been hit by pitches 50 times this season, most of any team. Rickie Weeks (18 times) and Prince Fielder (16 times) rank first and second in the Majors. The Cubs’ Marlon Byrd has also been struck 16 times. Weeks declined to talk Thursday night about the Ross Ohlendorf pitch that struck him in the fifth inning and sparked some tempers on both sides of the field at PNC Park. Fielder, who had words with the umpires when the teams were warned later in the game, did not make himself available to reporters. After the incident Thursday night, Macha did his part to work on eliminating the problem. As for what he thinks should be done about the issue, Macha made it clear he thinks some suspensions should be in order for the pitchers who are hitting his players. Macha said he hopes by talking to MLB officials that he can eliminate the problem before it reaches a point where his players are required to retaliate in a significant way. He added that he doesn’t think MLB would want such action to occur, either. MILWAUKEE — As up to eight inches of rain pounded the Milwaukee area on Thursday night, it seemed likely Miller Park would be affected by the flooding that impacted much of city. After all, the ballpark suffered extensive damage after a strong storm a year ago. Thanks to a recently installed berm between Miller Parkway and the Brewers’ staff parking lot, however, the service level at Miller Park was not affected by the storms Thursday night. According to Brewers spokesman Tyler Barnes, credit goes to the Wisconsin Department of Transportation. “The DOT, in the spring, really did a phenomenal job building this berm,” Barnes said. “They put up a berm to prevent any sort of flooding coming into the south dock. Last summer, a major rainstorm resulted in damage throughout the service level, which includes the home and visitors’ clubhouses as well as batting cages and a media interview room, among other things. As a result, all the furniture and upholstery in the home clubhouse was required to be replaced — with temporary replacements last season and more permanent furniture and carpeting prior to the start of this season. After the storm Thursday, the damage at Miller Park was no different than any other above-average rainstorm. “Sort of ironically, the service level is bone dry, and then in some of the areas of offices on the field level we had a few areas that got some water in them,” Barnes said. “Brewers enterprises, the ticket offices and the administrative office entrance had some water in them. MILWAUKEE — While the Brewers were in Pittsburgh throughout much of Thursday night’s storm, they certainly were among those who felt its effects. Rather than fly as regularly scheduled from Pittsburgh to Milwaukee, the club was forced to fly into Chicago as General Mitchell International Airport was closed due to flooding on the runways. From there, the Brewers bussed from Chicago to Milwaukee. According to Brewers broadcaster Cory Provus, the team’s flight landed in Chicago at 1:30 a.m. CT, while the bus arrived in Milwaukee just before 3 a.m. Veteran reliever LaTroy Hawkins threw 11 pitches for Triple-A Nashville on Thursday night. According to Brewers manager Ken Macha, Hawkins was scheduled to pitch another inning Friday for the “back-to-back days” part of his rehab assignment. … Left-hander Zach Braddock was unavailable once again for the Brewers on Friday. Macha said that Braddock was undergoing treatment and would likely miss a couple more days. … This weekend, the Brewers will celebrate their teams of the 1990s. Friday night, they wore reproductions of the Brewers uniforms from 1997-99 while welcoming Greg Vaughn and Jeff Cirillo back as part of the celebration. MILWAUKEE — A familiar face and voice has returned to the Brewers’ broadcast booth. Hall of Fame broadcaster Bob Uecker, who had been gone since April after having heart surgery, was back Friday in his familiar role alongside Cory Provus as Milwaukee’s play-by-play announcer. Before the series opener with the Nationals on Friday, Uecker was his usual self. Uecker announced that he would work every home game through the end of the season while also covering select road trips. Surgeons replaced Uecker’s aortic valve, a portion of his aortic root and performed a coronary bypass on one vessel on April 30. He was expected to return within 10-12 weeks, but a staph infection slowed his progress. Uecker said the infection, his inability to put the weight back on — he’s still 10 pounds down from before the surgery — as well as getting the right mix of medications have been the biggest struggles since he’s been away. Even with the setback of the staph infection, however, Uecker’s return Friday came exactly 12 weeks to the date of the surgery. “It’s been a long haul,” Uecker said. “Not from the surgery. I got that staph infection right after we had the last [news conference]. That was the thing that really put me down. I don’t know if it ever goes away. I’m still on a lot of medication for that. While he was away, Uecker joked that he was renting people to come stay with him due to the boredom of being away from Miller Park for so long. That, he said, was what he missed most during his time off: being in the clubhouse, around the guys and being with Provus and producer Kent Sommerfeld in the radio booth. Uecker’s doctors, Aldred C. Nicolosi and Jim Kleczka, in recognition of the work they did on the Brewers broadcaster, were given the opportunity to throw out the ceremonial first pitches before Friday’s game. After mentioning it, Uecker — right on cue — shared his thoughts about how they might do. Provus said earlier in the week that Uecker would have his usual pregame show with Brewers manager Ken Macha while doing play-by-play for six innings to Provus’ three. So how would Uecker make his return to the broadcast booth even better? “I’d like to win, I’d like to win all the time,” Uecker said. “I don’t worry about what I say or do. I could make stuff up. In my mind, we’ll win. But I want them to win. I always want them to win.